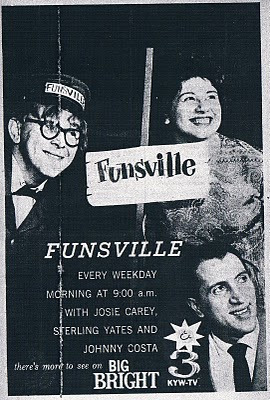 TV Guide ad for the show "Funsville" with Josie Carey, Sterling Yates and Johnny Costa..Ms. Carey first became famous for her "Children's Corner" on WQED-13, Pittsburgh's educational station, which had a brief Saturday Morning Run from New York on NBC-TV. Children's Corner was also famous for being the first TV exposure for Fred Rogers..He (and his sweater) would become a Childrens TV Icon through Misterrogers Neighborhood on NET/PBS for many years..Funsville, which originated at Westinghouse's KDKA-TV 2 in Pittsburgh, lasted on KYW about 2 years, from 1960-62, being replaced by Woodrow The Woodsman..
Our Facebook page has become very successful..We have been up on Facebook about 9 days now, with 146 fans from all over, including many current and former Cleveland Media people..What is surprising that others that are in TV and Newspapers, etc.. in other parts of the country have become fans as well, many of them former Clevelanders..Which is very humbling. What I like about Facebook is that I can find something to share , and put it up almost immediately, with immediate feedback..I like the flexibility of it as well.. 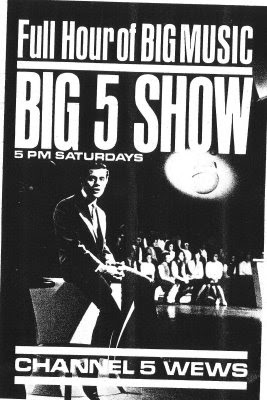 I am on a two week vacation from work..I may try to get up to Cleveland one day next week to do research for some of our next few posts here..Thanks for the great support of the blog..Have a good weekend..
TV Guide ad from the Big 5 days-Probably 1965..
Good evening:Tonight, I thought we would feature a two part video from WEWS Morning Exchange featuring Don Webster and "Upbeat"..This is from the December 17, 1997 edition of the "Exchange" with Fred Griffith and Connie Dieken on the occasion of the 50th anniversary of Channel 5..
Don Webster was a Chatham, Ontario native that was discovered in September 1964 by WEWS station manager Don Perris while on a vacation trip to Lake Erie with his daughter. 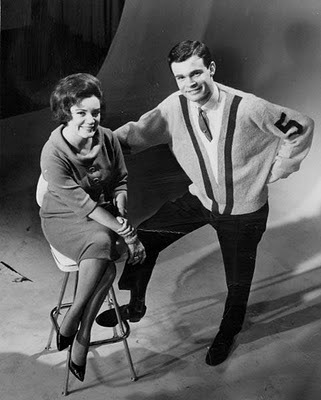 Webster was doing a Teen Dance show in Hamilton, Ontario..Perris' daughter suggested Webster would make a good host of The "Big 5 Show" which premiered in late September of '64..At first, Webster had Cleveland radio DJ's as co-hosts.."The Big 5 Show" became a huge success and was syndicated under the name "Upbeat" beginning in 1966..A lot of Popular music stars got their TV beginnings on Upbeat, Including Bobby Goldsboro, John Denver, Bobby Sherman (who appeared several times), The Animals, Otis Redding (who died in a plane crash shortly after appearing on Upbeat in 1967) , The 5th Dimension, Tommy Roe, The Outsiders, Paul Revere and The Raiders , and many others..They were augmented by "The Upbeat Dancers"
With the advent of large rock concerts, the days of the regional Rock Music Shows were numbered..Upbeat was canceled in 1971..Webster then became station weatherman, hosted The Ohio Lottery Bingo shows,Bowling For Dollars and was the First co-host of the Morning Exchange with Alan Douglas in 1972..For a time in the 1980's Don Webster was Channel 5 station manager..
As of 2007 Don was living in Retirement in South Carolina..
9:30 Hollywood Palace-David Janssen- Guests include: Chagrin Falls Native Tim Conway, along with Carl Reiner, Mel Brooks and The Harlem Globetrotters..
11:10 Weather-Court Stanton-Long Time voiceover announcer..He was most famed for his authoritative station id's for Channel 5..
As of early this afternoon, Cleveland Classic Media has its own Facebook Page..This will be for sharing photos from the early days of Cleveland Classic Media and possible exclusive-to-Facebook Content..Some Audio and Video as well..One thing I hadnt thought about..There is also a discussion page..So you can ask questions or share memories..
Wally Kinnan Ad from October 1965-TV Guide.. 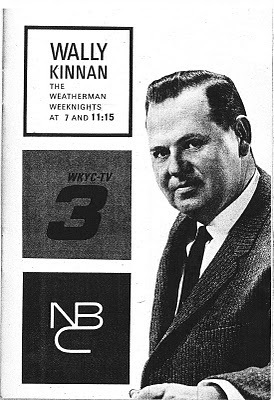 The Late Wally Kinnan was inducted into the Broadcast Pioneers of Philadelphia Hall Of Fame in November 2009..He was at WRCV-3 Philadelphia from 1958-65, before he came to WKYC Cleveland as Chief Meterologist in June 1965..Congratulations to the family on the well-deserved honor..
Broadcast Pioneers of Philadelphia Biography on Wally Kinnan..
Facebook Logo..Cleveland Classic Media, as announced below, will have its own Facebook page shortly.. While the name Art Clokey may not be immediately familiar to most tv watchers, he was the creator and inspiration behind "Gumby" a Clay-animation series that enjoyed several incarnations between 1956 and 1988 on network and syndicated tv..Clokey passed away at the age of 88. He also created "Davey and Goliath" in 1963 for the Lutheran Church.. According to the application Sitemeter, we had 219 visitors yesterday with 407 page views..Which is kind of unusual to me because there didnt seem to be a special reason for it..Normally there is a reason I can pinpoint for a spike in visitors, but not this time.. We usually average between 100-140 visitors a day.. Thanks to everyone for your continued support..
Ive decided within the next few days, to create a Cleveland Classic Media "Fan/Friend Page" on Facebook. 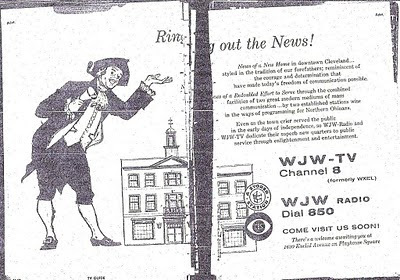 What I may do here is repurpose some ads and pictures used earlier in Cleveland Classic Media and Create some "new" content especially for Facebook, as well as announce Blog Updates and anything else that may come up..(YouTube, DailyMotion Content, etc. 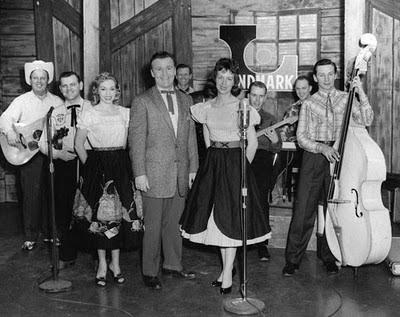 )I may also have other Facebook Folks contribute material as well..
Everyone take care and have a great weekend..
February 28, 1959-"LANDMARK MILESTONE -- with Lenny Sanders and the County Rhythm Boys in the background, starts of the weekly LANDMARK JAMBOREE program, Kathy Dearth (left), Tommy Edwards and Dottie West post on the occasion of the 2nd anniversary of Farm Bureau, program sponsor, this Saturday at 7 P.M. on WEWS. 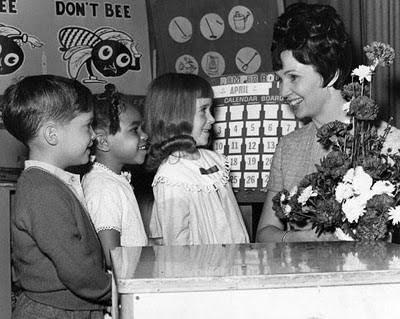 Show is now seen on WEWS, WSBD in Toledo and in March will add stations in Dayton and Columbus"
April 1967-"Happy anniversary Miss Barbara --- Little Flint Keller, Kim Humphrey and Marge Smith present Barbara Plummer with flowers, celebrating the 7th year "Romper Room" has been on TV 5 . 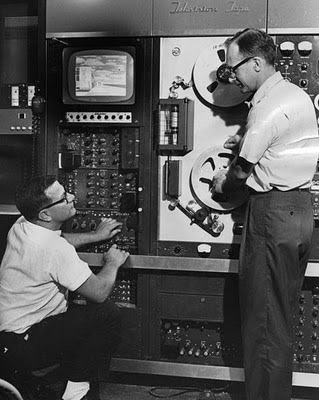 "Romper Room" is seen weekday mornings at 8:30 A.M."
Note:In 1966 the Big 5 Show was renamed "Upbeat" and became nationally syndicated until the show's 1971 cancellation..
July 18, 1962-BEHIND THE SCENES -- WEWS Engineers Harry Sykora (left) and Harry Reeves work on one of the two new Television Tape Recorders which have just been installed at Channel 5. Operation of the new machines is complex enough that both Reeves and Sykora are spending this week in New Jersey at a technical School (RCA) to acquaint themselves with the various intricacies of the machine's workings. 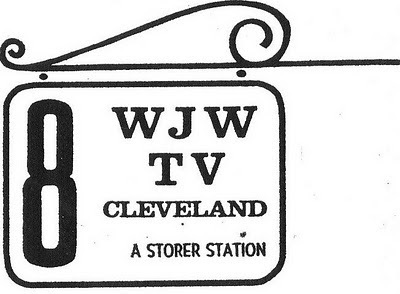 The two new machines are the biggest and costliest in town, but will give WEWS important additional facilities in TV Tape Recording and consequent upgrading of WEWS program material"
I've mentioned a site in passing a couple of times, "The Cleveland Memory Project" an online project of the Cleveland State University Libraries using mainly the photo archives of the former Cleveland Press Newspaper (1878-1982)..Among the Press photos are a number of TV station pictures, mostly to illustrate a TV aricle or simply remind viewers of an upcoming show..Today I simply want to share a few pictures from the Press Archive of WEWS-TV 5 from the 50's and 60's..The Pictures are above, with original captions and dates where available..The Cleveland Memory Project will be permanently added to our list of links on the side..